You may or may not have heard of this but there is a new bizarre trend in wedding receptions. Everyone on the dance floor wears a set of headphones and dances to whatever “channel” of music they want. First of all, I’m sorry, but to put it nicely, they look like idiots. Second of all, they are all dancing out of sync. Each of them is in their own little world. The room is perfectly quiet except in their heads. Let’s just say this makes things really awkward for the non-dancing crowd. Folks… it’s weird! It’s kind of hard to believe it’s a thing. So, friends… my question is, do we sometimes wear spiritual headphones? What I mean is, do we experience the grace and mercy of Jesus, whether we have just been born again, experienced the grace of repentance afresh, been blown away by something we’ve read in Scripture, had a heavy burden lifted from our souls, only to keep it inside of our noise-cancelling spiritual headphones? Friends, the primary means by which God has ordained His grace and truth to go forth is through the spoken words of those who have been transformed by that grace and truth! He has written a story of grace into your life and you are the only one who is able to share that particular story with those who need to hear that there is a savior named Jesus who lived and died and rose again for sinners like you and me! Friends, this good news is supposed to be bursting forth out of us like an amplifier set to 11! The gospel is good news for the world, not just for you! God sent His son, Jesus, to save for Himself individuals, yes… but also, a PEOPLE. It is not just about you and Jesus, Jesus and you. This is supposed to make noise. This is supposed to be uncontainable, something that oozes all over the earth, covering it all over as the waters cover the sea. The mountains and trees will break forth! Folks… It might get loud! If you have been made alive in Jesus, take off your noise canceling headphones. Let your quiet time break out into loud shouts and praises from the mountaintops. If you don’t, the rocks will! Friends, do you wear headphones that keep what others need to hear contained, or does the testimony of God’s transforming grace ooze out of you? We cannot change how people think about God, but we can live before them the change He has made in us. Is there someone in particular that you know who needs to hear the truth of the Gospel? He has written a story of grace into your life and you are the only one who is able to share that particular story with those who need to hear that there is a savior named Jesus who lived and died and rose again for sinners like you and me! If you have been made alive in Jesus, take off your noise canceling headphones and make some noise. 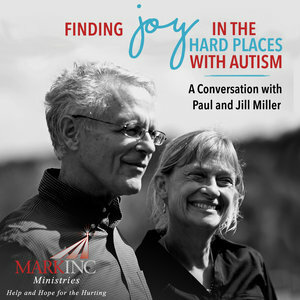 Tomorrow I will introduce you to Paula Miles, our last Guest Writer in this What She Said! series. I’m so eager for you to soak in the truths Paula shares. My favorite is her devotional on Living Stones. I’d love to hear which devotional touches you the most!